and Walla Walla Bangbang at www.tulsareining.com! FREE entry in the Tulsa Reining Classic. Friday Night Shiner is a 2003 son of National Reining Horse Association $4 Million Sire Shining Spark out of Tivito Norma by Tivito San. From the beginning, this distinctive buckskin showed that his great mind would afford him a long and successful showing career. With total earnings over $46,000 Friday Night Shiner placed sixth in the Tulsa Reining Classic Open Derby. He also won the L3 Open and third in the Level 4 Open ABI Futurity. He the Santa Hill Ranch Derby and was reserve at the Shadow Oak Plantation Derby. He won the Reining Thunder Show and placed third in the NRHA Derby Show II Open plus placed third in the NRHA 7 & Up Division Level 4. Now he’s passing that mind and trainability on to his foals. Friday Night Shiner is owned by and stands at Santa Hill Ranch. For information contact Robert Santagata at 845-294-3662 or info@santahillranch.com. Plus be sure to visit the website at www.santahillranch.com. Magnum Chic Dream captured the audience the first time walked into an arena and he’s had loyal fans ever since. From the beginning, the 1996 stallion was a crowd favorite. By Smart Chic Olena and out of Sailin Barbee by Topsail Cody, Magnum Chic Dream quickly emerged as a show horse deluxe. When his name was announced people would hurry to the pen to watch, waiting for his explosive spins and beautiful moves. He was ridden first by Patti Brownshadel to an NRHA Futurity Open finalist slot and the NRHA Derby Limited Open Reserve Championship. 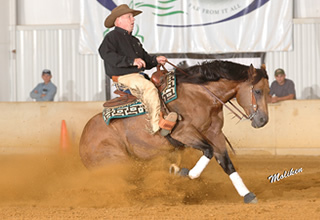 The next addition to his list of laurels was the 2004 AQHA Senior Reining World title with NRHA Professional Casey Hinton. He ended his show career with over 100 AQHA points and over $44,000 earned. When the time came to test Magnum Chic Dream as a sire, his sons and daughters quickly proved that they had inherited their sire’s explosiveness and trainability. They also began collecting an expanding array of championships and earning large prize checks for riders from professionals to Non Pros. Magnum Chic Dream is now an elite $4 Million Sire, and his foals simply continue to excel. 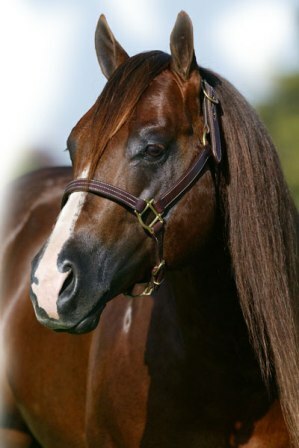 For information on Magnum Chic Dream, contact Kathy Hinton at Cedar Ridge Stallion Station at 903-564-7687 or hintonqh@verizon.net, plus visit the website at www.cedarridgestallions.com/magnum-chic-dream.html and www.magnumchicdream.com/. 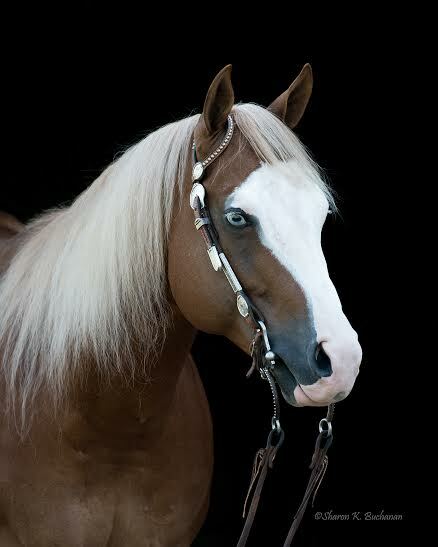 Wallawalla Bangbang is a flashy 2008 palomino stallion by NRHA $9 Million Sire, Gunner and out of Shiney Walla Wanda by NRHA $4 Million Sire, Shining Spark. His lifetime earning exceed $72,717 from a wide array of accomplishments including the 2011 AQHA Congress Futurity NP Levels 2 & 3 Reserve Champion, 2011 NRHA NP Futurity Finalist, 2011 Congress NP Level 3 & 4 Reserve Champion, 2012 Gordyville Breeders Cup NP Level 3 Champion and Reserve Prime Time, 2012 Wimpy Little Step Derby NP Prime Time Reserve Champion, Level 3 Champion and 3rd in Level 4, 2012 NRHA Derby NP PT Reserve Champion,3rd in Level 3, 2012 NRBC NP Finalist, 2012 Carolina Classic Derby NP PT Champion, 2012 Darling 888 Ranch Derby NP Level 3 Champion and Reserve in Level 4, 2013 ABI Open Derby 4th in Levels 2 and 3, 2013 Carolina Classic Open Derby 4th in Level 2, 5th in Level 3, 2013 NRBC Level 2 & 3 Finalist, 2013 Smoky Mountain Reins Open Derby – Reserve Level 3 & 4, 2014 Florida Classic Open Derby – Level 2 Champion, Level 3 Reserve, and 3rd in Level 4, 2014 NRBC Open Finalist – 1st go Level 2 Champion, 2014 NRHA Open Derby Level 2 & 3 Finalist, 2014 Darling 888 Ranch Level 2 Champion, 3rd in Level 3, 4th in Level 4, 2014 Volunteer Breeders Classic NP Derby Champion Levels 2-4, 2014 Smoky Mountain Reins NP Derby Reserve Champion Levels 2-4. For more information visit his Facebook page at https://www.facebook.com/Wallawalla-Bangbang-992602490797856/. You can also call Jennifer at 618-741-7940 or send an email to jerobinsonequine@icloud.com. Tulsa Reining Classic Appreciates all the Stallion owners who participate in this auction with these exceptional stallions!